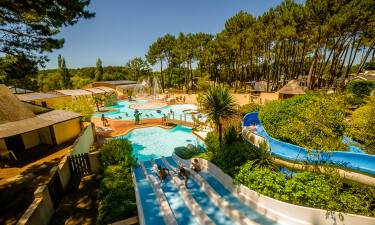 Nestled in a pine-tree setting, Le Fort Espagnol is within 3 kilometres of the beaches and 500 metres from the quaint Breton village of Crac’h. Le fort Espagnol is the kind of luxury camping site that leaves you with happy camping holiday memories. Your LuxCamp mobile home is well-appointed and provides the comforts of home. 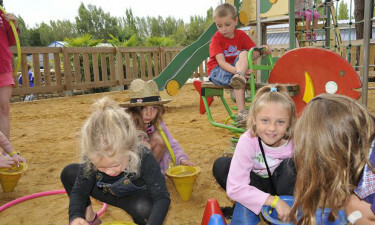 The many on-site facilities afford a range of fun activities for young and old. We know Le Fort Espagnol! The convivial atmosphere of Le Fort Espagnol encourages you to try a variety of activities. For instance, you can pull up a deckchair to watch the kids playing, have a pickup game of football, or walk to the bakery to sample the fine local bread. Why choose Le Fort Espagnol? What’s a camping holiday without an aquatic park. 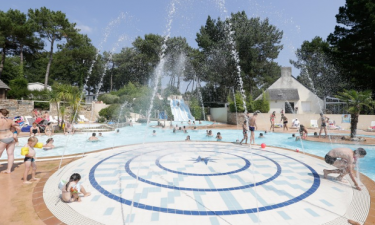 Camping Le Fort Espagnol has one covered pool and one heated outdoor pool with exciting water slides and playful fountains. Be sure to pack the sand pail and shovel because the long and rugged coastline of Brittany presents some lovely sandy beaches. Luckily, Le Fort Espagnol campsite is a mere hop from the beaches.